The saying goes: you can't go home again. Olga Karman says you must. No matter how difficult the encounter might be, it gives us perhaps our best chance to come to terms with ourselves. Olga Karman recreates a vast piece of personal and social history as she describes her flight from her native Cuba amid politicial turmoil, her struggle for a new life in the United States, and an eventful return visit to Cuba some 37 years afterward. Scatter My Ashes Over Havana depicts these experiences with a poet's keen language. It shows the flight of Hispanic peoples for social and political recognition in Buffalo, a city that receives an especially colorful and sympathetic portrayal. Raúl and I worked on a mission for another Puerto Rican named Raúl. The man was running for city court judge, the first time a Hispanic had done so in Buffalo. Son of a migrant family, Raúl Figueroa had worked next to his father in the tomato fields not far from Buffalo, scrubbing his little green hands with Clorox so other kids at school wouldn't make fun of him. His high-school guidance counselor had urged him to go into vocational training: "You're good with cars and electrical things. You're not really college material." Figueroa ignored the advice, went on to college and law school, and passed the New York State Bar exam on his first try. This is a book about exile and immigration, about the search for identity in a new land, and about a woman's hard work in making a life for herself and her children. It is also, most profoundly, a book about finding home. A sharp left, a right, and I spot her: my house. Can this be my street? It's deserted, silent. I feel as if I'm swimming under water with plugs in my ears. Never mind. Here she is. Mi casa. Mi amiga. They've painted you cornflower blue, just like Onésima's bluing cubes. How pretty you look in blue. "'Who remembers how Havana glowed at night long ago?' Olga Karman does. And much more, in this poetic, tactile memoir about loss and the sometimes futile search for home." 'In Scatter My Ashes Over Havana, her evocative memoir of exile in the late twentieth century, Olga Karman has produced a portrait of feminine courage in the face of political and private adversity. To a lively account of a Cuban exile's life in the United States, she brings a passionate understanding of history and a subtle eye for its nuances." "Deeply felt and beautifully written, Olga Karman's memoir undertakes a probing and unsentimental exploration of the high cost and moderate rewards of exile. A gem of a book!" 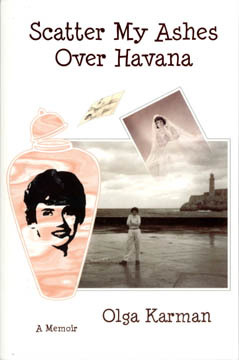 "Scatter My Ashes Over Havana is a unique story of a Cuban woman's struggle to live away from her homeland and to assert herself in the midst of dispossession. With honesty, deftness and dignity, Olga Karman traces the multiple roles she assumes in her exile, those of daughter, mother, wife, student and teacher. Her return to Cuba, harrowingly described in this memoir, represents the triumph of will over circumstance."